PLEASE NOTE: Registration for this event has been disabled as we are moving to a new website on Saturday - 3/30/2019. Please check back here for details or visit our new website which will be announced once it is up and running. CATHEDRAL CITY PRIDE FESTIVAL - SIGN UP AND VOLUNTEER AT OUR BOOTH. Cathedral City Pride Festival is coming up on (March 29 - 31) and GOPS will be taking part! GOPS will have a booth on the grounds at 68-700 Avenida Lalo Guerrero (near City Hall) in Cathedral City on Saturday, March 30. We will be talking to old friends, current and former members, persons who are interested in outdoor activities, and maybe we’ll find some new members! We’ll be talking to interested persons about our hikes, bikes, campouts and social activities. The booth will have maps of our activities and photos of our past events. We’ll also be collecting email addresses from interested persons, who in exchange will receive a GOPS tote bag and the newsletter for three months. Last year at our Cathedral City Pride Booth we talked to old friends, made new friends, and interested a number of new members. We hope to add some more new members at this year's Cathedral City Pride event. To volunteer, select REGISTER, and then choose the time slot(s) that you would like to be at the booth. We need 4 persons for each two or three hour time slot. Volunteers will receive a free GOPS tote bag, and our gratitude. 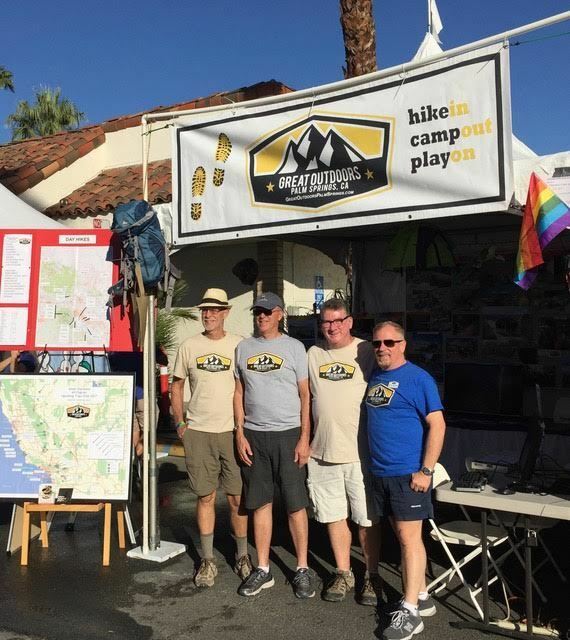 Here’s your chance to help spread the word about Great Outdoors Palm Springs, increase our visibility in the Coachella Valley LGBT community, and have some fun! Bottled water for volunteers will be available in the booth. We have not yet received our booth number or location. We will send out detailed information to volunteers on Wednesday March 27.